Goblin time! 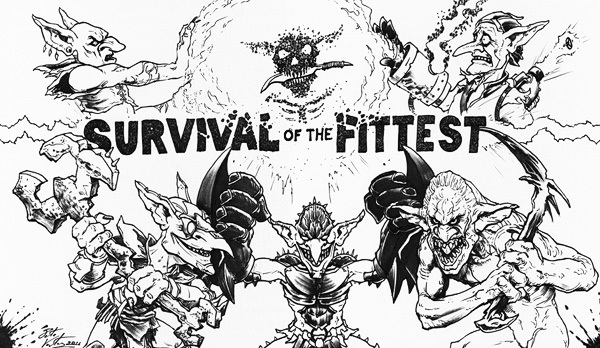 This is a recent commission on a playmat featuring a variety of my goblins from across the years of M:TG. It’s a commission, so it’s pre-sold. However, doesn’t mean you can’t have something made to your specifications. Will you be posting the piece that you did for New Phyrexia on your blog anytime soon? Adam, probably not. I ended up not liking the piece but had no time to change it. That happens occasionally unfortunately. Also, Blue has always been my weakest color for cards so having the Phyrexian card I was assigned be Blue didn’t help matters. Very cool! What does something like this cost typically? Typically $60 to $200 depending on complexity. My email is on the sidebar if you want to contact me. …whoever commissioned this is some long-forgotten randomer I beat at the Legions prerelease, I know it. Good eye, Dunjohn. Not many would have spotted that was ole Skirkie.